January | 2010 | English, ESL -- and more! 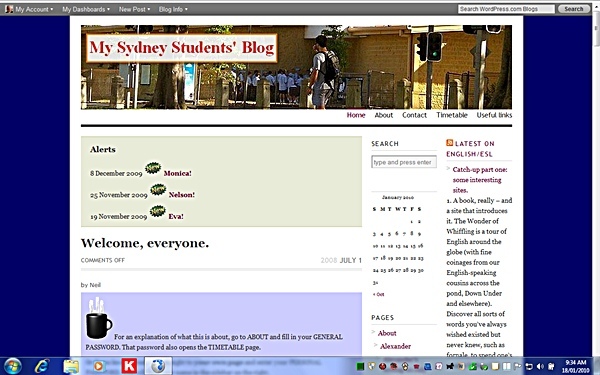 After eight years at my various addresses, beginning on Angelfire then Tripod as my class page and then morphing into the Sydney Boys High School English/ESL site (to 2005) and then on my retirement to its current mode, I am at last ceasing to update this blog, though I will be back to update some of the existing posts and pages and to deal with comments. Thanks to all for the support over the years. This continues though: limited entry. See student blog — mostly password access. I trust much on this site remains useful for some time yet, but do note links can no longer be guaranteed and for some topics you should do your own searches for the latest material.